Division Two champions Sensas Mark One. Saturday was a very big day for Peterborough & DAA as they hosted the Division Two National on the North Bank of the River Nene. It was a brave decision to offer up the venue for selection to the Angling Trust and they in turn took the gamble to use a venue that has not been match fished to any degree for a very long time. In practice matches and team practice sessions some big bream weights had been taken but good nets of roach were hard to come by. I had reports of double-figure weights but not many. Come the day the conditions were far from ideal and with local teams, Peterborough & DAA, Castaways AC, Crowland AC, Sensas Mark One and Stanjay Tackle all in the mix, local knowledge proved to be all important as all of the clubs decided on a very negative approach to most sections. It turned out to be the perfect way to get promotion back to Division One with Sensas Mark One putting in a magnificent team card to be crowned Division Two champions with 201 points. I was there to witness the whole day and I must say l was very impressed with the Mark One team commitment. Even when the going was tough with the wind and rain howling down the river, they all stuck to the team plan. It was like watching the Mark One side of old, quality anglers that never gave up until the final whistle. Small fish were the order of the day and they managed to find enough to get good points in poor sections with several outstanding performances bringing back big point scores. Also promoted were Peterborough DAA, who came seventh, and Castaways, who did really well to finish ninth in their first national competition. Unfortunately Stanjay Tackle (14th) just missed out on promotion and Crowland (22nd) will have to battle it out again in Division Two. On the individual front congratulations should go to Simon McCormac on taking the title with a huge 25.21kg of bream and also to Mark One brothers Bob and John Bates, who were fourth and sixth respectively with 5.93kg and 5.55kg. Finally a big thank-you should go to Peterborough & DAA for a very well organised event and to all the stewards that had the thankless task of getting anglers safely to their pegs and then assisting at the weigh-in. The National on the River Nene was not the only big event taking place at the weekend. 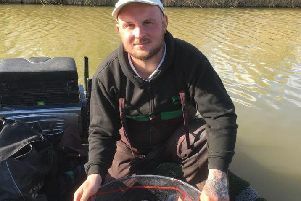 BB Project officer Szymon Skoczen, who delivers project activities under the Nenescape Landscape Partnership Scheme, supported a great fishing event at Ferry Meadows. On Sunday over 60 anglers from Poland gathered to fish the River Nene and Ferry Meadows Lakes. Over 300 predatory fish were caught and all of them returned safety to the water. I hear it was a great day out for all those taking part.